Saint Nicholas (270–6 December 343), or Nikolaos of Myra, was the Bishop of Myra. He was born in the Greek colony of Patara, in Asia Minor. Myra is near Antalya, in modern-day Turkey. In the 11th century, his remains were taken to Bari, Italy, to save them from Turkish (Muslim) invaders. He is the patron saint of very many groups, including thieves and murderers. So far as is known, what he did in that respect was to protect the falsely accused. He is venerated in both Eastern Orthodox and Catholic Churches. His parents were relatively well-off. Nicholas is said to have distributed his fortune among the poor. This is relatively well documented. Less documented deeds of his include saving children from drowning. He helped seamen in a storm and saved a child that was abducted. 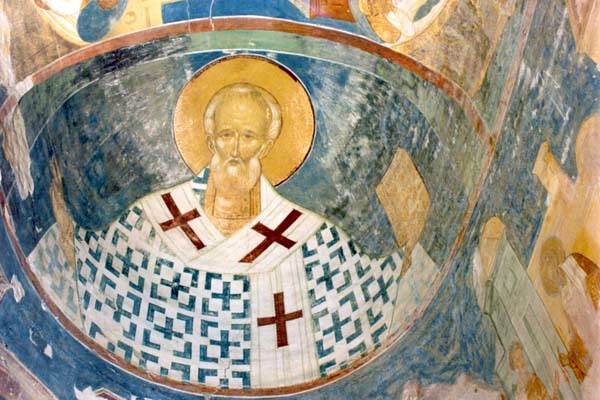 In the Eastern Orthodox Church, Saint Nicholas of Myra is a very prominent figure. Very often, the third large icon on the Iconostasis in Orthodox churches is devoted to him. The other two are usually devoted to Jesus, and to Mary with the child. The modern composer Benjamin Britten composed a cantata for orchestra and choir about the life of St. Nicholas. It is very popular and often performed. He is the Saint behind Santa Claus. He is the patron Saint of Children, of Seafarers and merchants. The Hanseatic League chose him as their patron saint. Over 400 churches and several thousands all over the world are named after Nicholas of Myra. He is also the patron saint of both Amsterdam, capital of Netherlands and Moscow, capital of Russia. Tryptych in Bari. Gentile da Fabriano, about 1425. A modern metal icon of St. Nicholas by the Bulgarian artist Georgi 'Chapa' Chapkanov, depicting the patron saint of fishermen holding a fish. Gilbert House, Stanley, Falkland Islands. 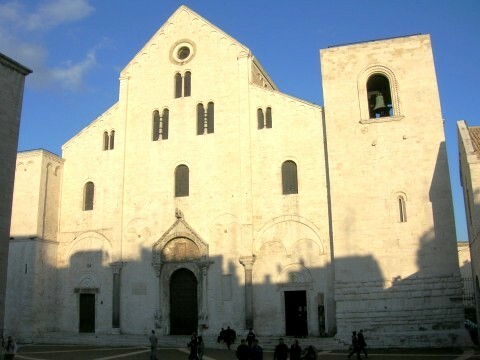 Basilica di San Nicola in Bari, Italy where most of the relics of Saint Nicholas are kept today. 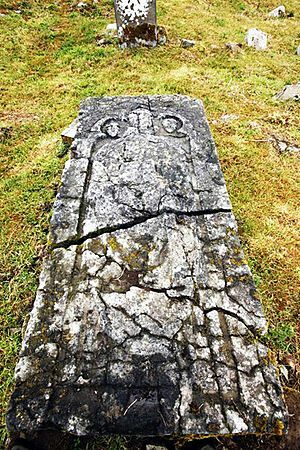 Tomb of Saint Nicholas near Thomastown, Ireland. Detail from a window in Rochester Cathedral. 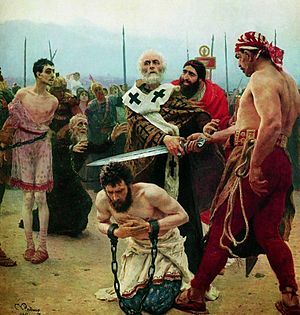 Saint Nicholas is shown bringing the boys back to life. A key ring with the image of Nikolaos of Myra as patron of the sailors. Russian Orthodox statue of Saint Nicolas, now in a corner near the church in Demre. Saint Nicholas Facts for Kids. Kiddle Encyclopedia.